FLORENCE, Ala. – Students and teachers in the state of Alabama will have a better understanding of math, thanks to the $922,813 in grant money math and computer science professors Cindy Stenger, Janet Jenkins, Jessica Stovall and James Jerkins have received for their joint collaboration project, The Collaborative Partnership to teach mathematical Reasoning through Computer Programming (CPR^2). “We’re close to a million dollars since 2013,” said Dr. James Jerkins, assistant professor of computer science at UNA. “At the end of 2012, we applied for a math/science partnership grant to work with high school and middle school mathematics teachers. The general goal was to improve mathematics education in Alabama and re-introduce some meaningful computer science experience along the way, “he said. Jerkins said the grant was awarded in 2013 and was slated to last three years, which would make this the last month for it. So in the spring, the group came together and decided to apply for the grant again. The grant, which is awarded by the Alabama State Department of Education, ultimately comes from the U.S. Department of Education Math and Science partnership. Stenger said those classes were courses like calculus 1 and computer science 1; they wanted to find where the gap was. What were they missing? How could they make student success rates higher? “We decided that the overarching problem was that students couldn’t move from working by examples to working theoretically, “said Stenger. “So the whole idea was to develop an explicit method to teach abstraction. That’s a skill we assumed students would have by the time they arrived at UNA, but they didn’t,” she said. And that’s where computer science comes in. Stenger and Jerkins said the team used computer programming to build the mental frameworks for abstraction. They were then able to develop a method that has been extremely successful at teaching instructors and students to start writing general expressions, and using those expressions in logical arguments and speaking in more abstract terms, which they both say is an imperative skill when it comes to working in the STEM fields. But they still had to implement the CPR^2 program, and they found that local high schools and middle schools would be the best place to start. “We’re specifically targeting their mathematical ability and we’re using the computer as a vehicle to do that,” said Jerkins. “So we’ll pick a concept we want to work with. We’ll develop some very small, simple computer code for the program and then the students work with those programs. What they’re trying to do is get a deeper understanding of what’s going on. So instead of just saying even numbers are two, four, six, etc., now they have a deeper understanding of what it means for an integer to be even, not just here’s the definition of an even number, now memorize it,” he said. Jerkins said the benefit of students using the computer to learn these concepts is twofold. For one, students are more apt to participant if they can play with the computer; and, two, Jerkins gets the opportunity to show these students some simple coding and introduce them to that world. And that’s important, because according to both professors, computer science and mathematics are basically brothers from another mother! Stenger said that within a concept they will have students and teachers explore by writing mini programs, the different characteristics of that concept. They’ll then look for ways to generalize that concept and have a general idea for it. When enough general ideas are gathered, they can start to make conjectures about the relationship among them. The culmination is a written logical argument from the student or teacher for these conjectures using mathematical language. The computer is the tool that they’ve chosen, but the professors said there are many other tools that could be used to get the learner to build mental frameworks for mathematical concepts. “You could go old school if you wanted and use a pencil and paper, and build big tables. You’ll do computation after computation and after a thousand are done … Oh I’ve finally figured it out, and now I’ve got that mental framework,” said Jerkins. Stenger said the key is to engage students individually and the computer does that. Most students see the computer program as a game, so when it tells them they’re wrong, it’s a challenge for them; whereas, if a teacher is constantly telling them they’re incorrect, it can get discouraging. Jerkins said the CPR2 project’s initial focus has always been on high school and middle school math teachers first. Because of that, they host a series of professional development sessions, which occur during the academic year and during the summer. So far more than 500 students and 150 teachers have participated in the CPR^2 program at UNA, but as the group starts another three-year run, what are the tangible results? “I think we’ve seen two substantial outcomes. For one, we’ve been able to engage with the students and speak with them about STEM and the careers related to the field, and that’s been really positive,” said Jerkins. “I think based on the feedback from the teachers who have participated, it’s had a positive impact on what they do in the classroom and I think that’s translating to their students, “he said. Stenger echoed those sentiments. “They say it changes the way they think about their material and how they approach it. Because everything we do is built from the ground up, when they’re talking to students they’re thinking about where does this come from? What’s the meaning? What’s the connection behind it? Even with us, it affects the way we approach our students daily,” said Stenger. Another benefit that both professors agree on: these students now see UNA’s faculty as the experts when it comes to STEM. 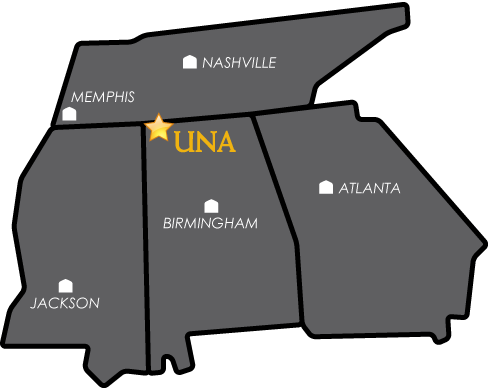 “We’re trying to change the way UNA is perceived in this region as a STEM center,” said Stenger. “So with the summer STEM camps, we want them to meet the faculty and see the facilities and start to think UNA when they think of STEM majors,” she said. The ultimate outcome for this project is the students who come to UNA are STEM ready and according to both professors, it’s already happening.